What does the Southern Front Doors and the Texas Home and Garden Show have in common? You can visit both at the Stadium this February. We are excited to announce our participation in this year’s show and look for to make our custom doors the highlight of the event. Southern Front Doors is a family owned business. The owners, Jesse and Liz Salinas, purchased the business from Sam and Susan Fortenberry in 2014. Through our 28 years of experience, we continue to deliver a durable and quality product at an affordable rate. For instance, we are confident that our company can meet or beat our competitors’ prices. We offer standard and custom size products in wood, iron, fiberglass, and steel material. Additionally, we stain our wood doors the traditional way: with an oil-based finish. For our local customers, we offer installation and our Crate& Freight Program. This program provides curbside delivery to the location of your choice. 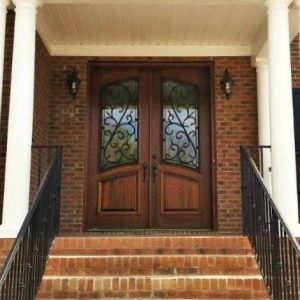 All in all, we are your one stop shop for your custom door needs. We are excited to participate in this year’s home and garden show as we look forward to meeting new clients and seeing the familiar faces of our current clients. For information about our company and our services, you can contact us at 281. 890.5860 or visit our website here.